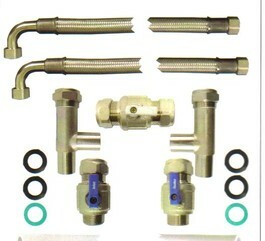 Universal 19mm fitting kit suitable for installtion of most water softeners on direct mains systems. Contains all the components necessary for the DIY or trade installer. With pre-made hoses for easier installation, including 22mm tee's incorporating check valve, 19mm braided hoses and 22mm isolating valves.